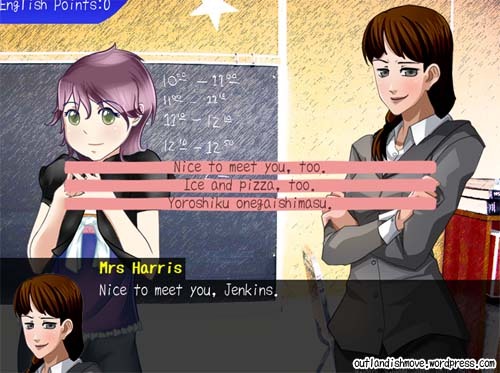 Why don’t the characters move much, like in other visual novel games? In order to keep the game free, only free resources (or as low-cost as possible) have been used. This includes vast use of Creative Commons communities. The artists who drew the characters did so before this game was made (which means it’s also likely that you’ll see them in other free visual novel games online). This means that character poses and positions were down to the artists themselves when they first created the sprites (characters). Though all of the characters can emote through their faces, only Wayne has different body positions. His sprite (known as Genki, and available here) actually has another pose that didn’t get used in the game. Any other character modifications were done with the artists permission (for example Michelle’s hair). There are a total of 20 different endings. Some good, some not so good. What do the passwords mean? The passwords are your proof that you reached a certain ending. I used the first version of this game for one of my classes and gave out challenges are reaching different endings. What program was used to make this? To make the game I mainly used a program called Ren’Py. You don’t need to know a lot (if any, to be honest) programming languages to use it, it’s a really simple program. As for images, characters were done by different artists (you can see them on the credits page) as well as backgrounds by different photographers. I did use photoshop on most of the backgrounds, though. I started working on the story on the 29th of August 2012, and had a completed version by 5th March 2013. I’m still working on an audio version, and hope to have that completed by the end of May (2013). How to I reach ending number~? It’s still too early to give out hints, don’t you think? Keep your eye on the spoiler page though. As we all recorded out lines in different places I’m not entirely sure what equipment everyone used. I’d recommend asking the VAs (the links are on the credits page), although maybe that info is on their websites. For the spy character, I used a Samsung Meteor Mic.